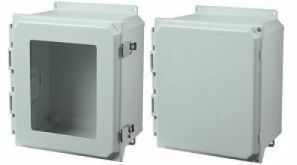 Authorized Distributor of Allied Moulded Products Products > Radar Inc.
Allied Moulded Products is the choice for nonmetallic electrical boxes and enclosures in today's residential, commercial and industrial markets. Leveraging more than half-a-century of experience, Allied has grown to become the benchmark of quality within the electrical industry. Their industrial enclosures can be found all over the world in many different control applications such as industrial & manufacturing plants, waste water treatment, wind turbines, security, solar, marinas, data & telecommunications, mining, and more. Designed with both the electrical professional and the do-it-yourself home owner in mind, Allied’s products have earned a reputation for strength, rigidity and innovation.